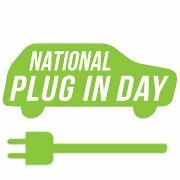 Join Us for National Plug In Day! DENC is excited to announce the Northern Colorado 2013 National Plug-In Day event, a day to spread awareness of electric vehicles! On Monday, September 30th, DENC and all the Northern Colorado EV owners will gather at the Fort Collins Museum of Discovery for an EV photo shoot to help show others in Northern Colorado that EV use is expanding quickly in Northern Colorado. Please come and join us with your EV as we gather in the parking lot at 408 Mason Ct, Fort Collins, CO from 12pm-1pm. We will take a photo at 12:30pm from the top of the museum to capture the number EVs that are in our community. Bring your DENC t-shirt or we will supply one. Also please make sure to bring your EVSE as part of the photo will have everyone plug their car and hold the plug to the sky. We will see you on Monday for this electrifying opportunity to demonstrate our progress, and to continue to spread the word about plugging in! Date and Time: Monday, September 30th. 12 noon-1pm.